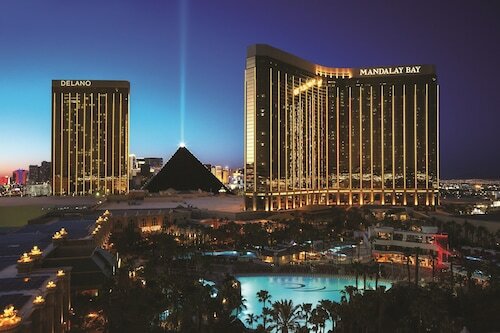 Lock in a Las Vegas vacation package on Expedia today! This is one of the best ways to save time and cash for your amazing vacation. Wouldn't it be nice to save up to C$590*? Book your group's package deal on Expedia now! Our enormous database offers more than 321,000 properties worldwide and 400 partner airlines. With such a terrific range of options, organizing your dream vacation will be a piece of cake! You can alter your travel bookings with us because we don't charge cancellation fees for almost all of our reservations. We've got all the red hot sightseeing tips for your trip to Las Vegas. Grab your travel organizer and prepare to start topping up that itinerary. Las Vegas is where you'll find the Las Vegas Convention Center. People come from all corners of the globe to lay eyes on this iconic sight, and we highly recommend you join them! As you stroll around marveling at the city's sights and sounds, make sure you keep an eye out for Fashion Show Mall and Las Vegas Premium Outlets. These notable attractions are sure to be one of the highlights of your day. From comics to cookbooks, Clark County Library has oodles of reading material for avid bookworms. Why not join a tour and discover more about their in-house collections? Travelers in this destination are spoilt for choice. We all love our furry and feathery friends, but how about hanging out with those who are a bit more slimy and slippery? Meet some of the most fascinating residents of the underwater realm at Shark Reef at Mandalay Bay. Still got some time on your hands? Boulevard Mall is an excellent place to go if you're craving a bit of window-shopping. With crowds of people bustling in and out, there'll be plenty of fellow shopaholics to keep you company! We all know you don't go traveling to sit in a cramped plane seat and go to bed in a different place. Vacations are all about the adventures you have while you're away! Have some time up your sleeve? 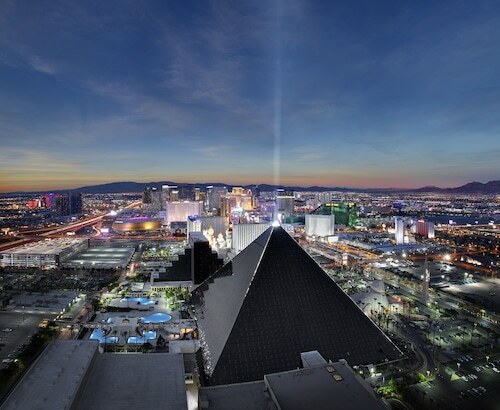 Make your way to our Las Vegas things to do page for a full range of options. 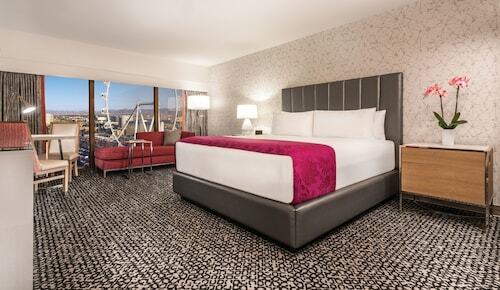 With as many as 170 properties in Las Vegas, finding a place to rest your head won't be difficult. But why delay? Book early via Expedia and kick off your next cheap vacation or luxury getaway. After an exhausting flight, there's nothing like kicking back in a flashy room and ordering some room service. See what delectable treats await you at The SKYLOFTS at MGM Grand (3799 Las Vegas Boulevard) or the Caesars Suites at Caesars Palace (3570 Las Vegas Boulevard South). If you'd rather spend your cash on things such as action-packed adventures and wild evenings out, why not investigate a few of our cheaper options? The Signature at MGM Grand (145 East Harmon Avenue) and the Tahiti All-Suite Resort (5101 W Tropicana Ave) are a couple of recommended ones. Of course, another great option is to stay near the Las Vegas Convention Center. You can do this by reserving a room at the AAA 1 Bedroom Convention Center Luxury Condos, which is just 0.5 miles (0.8 km) away. Also popular is the AAA 3 Bedroom Convention Center Luxury Condos, 0.5 miles (0.8 km) away. The airport probably isn't going to be the most exhilarating moment of your adventure, but there's nothing like the feeling of knowing that your well-deserved trip to Las Vegas is just a plane trip away! Once you step off the plane at McCarran International Airport (LAS), you'll be 2 miles (3 km) from the middle of town. Get a glimpse into the underworld of Las Vegas’s gangster past at this unusual museum. Shop amid faux golden statues at The Forum Shops at Caesars — opulent retail at its best. See animals housed in authentic habitats at the Southern Nevada Zoo, a small complex with a big mission to teach visitors about protecting the homes of endangered species. 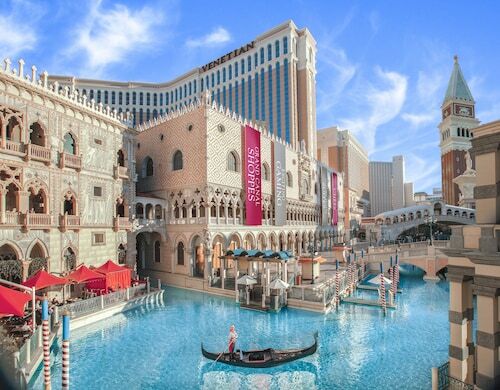 The old-world grandeur of Venice meets the glitz and glamor of Las Vegas in this expansive shopping mall and dining hot spot themed on Italy’s most romantic city. Discover the signature glitz and glamour of Las Vegas at this shopping mall on the Strip, home to over 200 shops, restaurants and live entertainment venues. Say a speedy “I do” or renew your vows at Las Vegas’ famous quickie wedding venue, where celebrities including Judy Garland, Slash and Michael Jordan were married. Watch Las Vegas Boulevard light up with spectacular fireballs at this signature attraction, which features a fantastic musical accompaniment and special effects. Test your luck at one of Las Vegas’ biggest casinos. 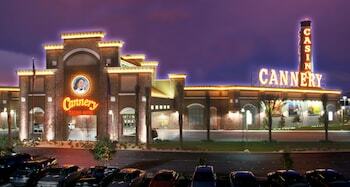 Feel the exhilaration of betting at one of the table games or try the fun and flashy slot machines. Edmonton Intl. - McCarran Intl. Tue., 10 Dec. - Tue., 10 Dec.